The alarm rings and I slip out of bed. It’s still night, still dark. Still in the fives. First I light a candle, then whisper prayers. Soon, I’m in the kitchen, the quiet kitchen–all the house still asleep. Those faces like angels, relaxed, dreaming, cuddled next to favorite pillows and stuffed creatures. They’re easy to stare at, those sleepy, beautiful little ones. Flour is in the air. The mixer is running and suddenly the morning light slips through one window, then another. Bright light fills corners and highlights the white cabinet, the pale yellow wall, the shutter, the palm. I step away from the kitchen, open the front door and listen to the mockingbird who is shouting every tune he has ever learned in succession. The neighborhood is filled with his wild melody and I smile, thankful for the way he greets the day. This entry was posted in On Baking and tagged baker's hours, early morning by janegmeyer. Bookmark the permalink. beautiful… new mama’s hours… I can certainly relate to that right now. Thank you for the beautiful poem and photo. 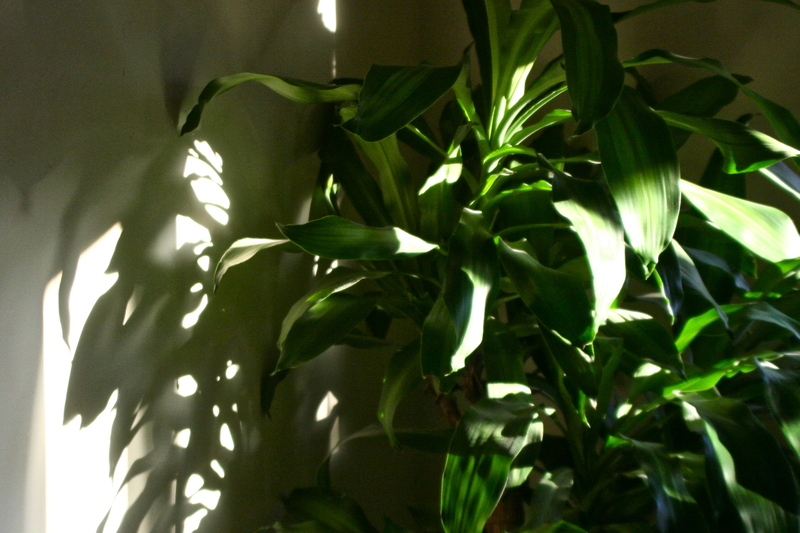 If I had the time, I would do a watercolor painting of that plant and the wonderful shadow.